Under the current CAP, the redistributive payment is applied by 9 Member States: BE-Wallonia, BG, DE, FR, HR, LT, PL, RO and UK-Wales. The financial allocation to the scheme takes up from 0.5% to 15% of the Member States national ceiling for direct payments. The payment aims at achieving a more effective income support for smaller farmers by granting an extra payment per hectare for the first hectares below a certain threshold. All farmers eligible for BPS/SAPS receive the redistributive payment. However, they only receive this payment up to a certain number of hectares per holding. As a result, only a part of the BPS/SAPS area receives the redistributive payment. For most Member States the redistributive payment is paid on approximately 50% of the basic payment area. Member States had the option to fix the top-up as an amount up to 65% of the average national/regional direct payment per hectare. However, this maximum amount is not used. The shares go from 0% for the first tranche in PL to 35% in BE-Wallonia. Under the legislative proposal for the CAP post 2020, the scheme is made compulsory but virtually all the parameters (the thresholds, the unit rate) are left to Member States to decide and to justify in their CAP Strategic Plans. The only EU limit is that the redistributive top-up cannot exceed the national average amount of direct payments per hectare for that claim year. Given that only 9 Member States use the redistributive payment when it is voluntary, it will be interesting to see what is the minimum allocation that a Member State can get away with for this ‘compulsory’ scheme. The Commission impact assessment provides an assessment of both capping and the redistributive payment in targeting support on small and medium sized farms, targeting support on farms with the lowest incomes as well as leading to a fairer distribution of support. However, the scenarios modelled differ from each other in significant respects, so it is hard to make a like-for-like comparison of the relative impact of these different instruments. Also, none of the modelled scenarios map exactly to the options put forward in the Commission’s legislative proposals. For this reason, Vincent Chatellier (INRA, SMART-LERECO) has made a very useful contribution by simulating different scenarios regarding the redistributive payment and capping for France, using French FADN data and the Commission legislative proposal, and assuming France continues to apply the redistributive payment as it does today. His paper was presented at the recent annual meeting of the French Society of Agricultural Economics (SFER). He constructs six different scenarios, three relating to the redistributive payment and three relating to capping. All scenarios are simulated using data for 2015. All scenarios are budget-neutral. France is one of the 9 Member States to use the redistributive payment in 2015. Its intention was to gradually phase in the payment, using 5% of its national direct payments ceiling in 2015 (worth a top-up of €25/ha on the first 52 hectares) and increasing by 5 percentage points each year to reach 20% of the ceiling from 2018 onwards. However, the French government took the decision in 2017 to temporarily hold the share at 10% (due to the difficult grain harvest in 2016) and in 2018 to leave it permanently at 10% (partly in recognition of a further transfer from Pillar 1 to Pillar 2). Thus the simulations for the redistributive payment are relative to a 2015 baseline where a small redistributive payment has already been introduced. A further issue of relevance to France needs to be explained before describing the results of the scenarios. France has had a long tradition of group farming going back to the 1960s – the GAEC (Groupement Agricole d’Exploitation en Commun) – based on farmers pooling land, labour and capital. In 2010 GAECs accounted for 7.6% of farms and 15% of agricultural adult work units, although their incidence varied greatly across regions. The law recognising GAECs specifies a legal minimum of two partners/associates and a maximum of ten, with the requirement that all partners work full time on the farm. The law also incorporated a ‘transparency principle’ (Article L323-13 of the French Rural Code) under which the State, for its agricultural support programmes, treats each partner as an individual entity, while also recognising a GAEC’s collective identity. This ‘transparency’ principle allows GAEC partners to benefit from public incentives on the same basis as individual farmers. The ‘transparency’ principle for GAECs was fully recognised in the CAP 2013 regulations (for example, Article 11.5 of the direct payments Regulation 1307/2013) which allows the benefits of any exemptions to be ‘passed through’ to the individual members of a GAEC (incidentally, Norbert Röder in a comment on this post points out that similar complicated issues of joint ownership arise in the case of East German large farms). DP1. Capping is introduced as foreseen in the Commission’s June 2018 legislative proposal. The maximum payment is limited to €100,000 per holding, with degressivity introduced between €60,000 and €100,000. GAEC pass-through is allowed, and wages of salaried employees but not the implicit cost of family labour can be deducted from the payment before the limit takes effect. The proceeds of capping are distributed to all first hectares below 52 ha which is the current French threshold. DP2. Capping is introduced at €60,000 per holding, with no deduction for labour use, but GAEC pass-through is allowed. 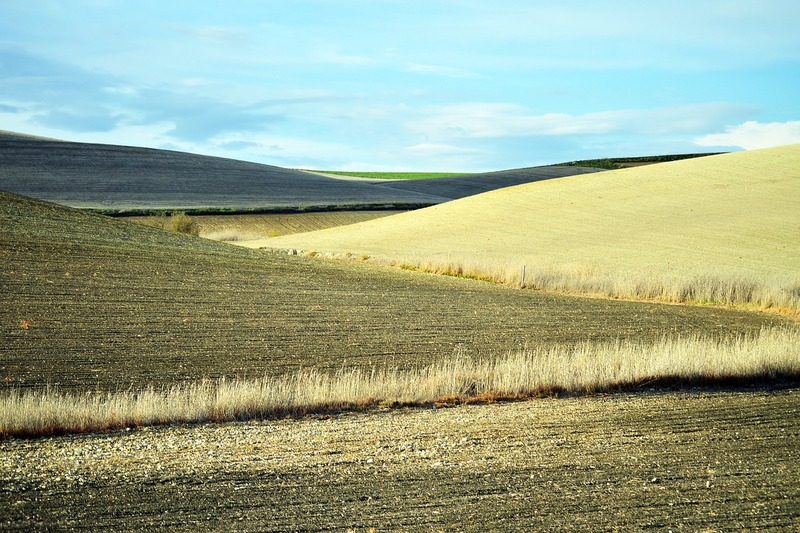 The proceeds of capping are distributed to all first hectares below 52 ha. DP3. Capping is introduced at €60,000 per holding, with no deduction for labour use, and GAEC pass-through is not allowed. The proceeds of capping are distributed to all first hectares below 52 ha. PR1. 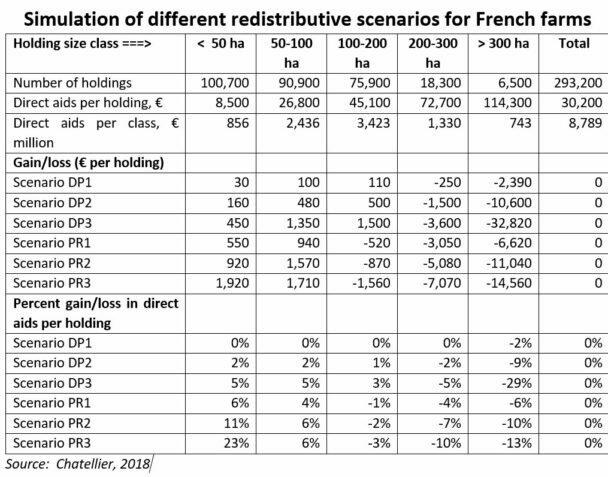 The redistributive payment share is set at 20% of the direct payments envelope rather than 5% in the baseline, the share originally foreseen by the French authorities, which amounts to an additional payment of €100 per ha for the first 52 ha, and GAEC pass-through is allowed. PR2. The redistributive payment share is increased to 30%, the maximum permitted by the current DP regulation. GAEC pass-through is again permitted. PR3. The redistributive payment share is increased to 30%, but the maximum area to benefit is reduced from 52 ha to 30 ha. GAEC pass-through is again permitted. It can be seen that the amounts redistributed under the capping options are very limited (€25 million for DP1, €127 million for DP2 and €360 million for DP3). The scenario DP1 is most like the Commission’s legislative proposal, although it does not allow the deduction of the equivalent wage paid to family labour as proposed by the Commission. This would further diminish the amount of resources redistributed in this option. Even without simulating that additional deduction, the proposal has almost no impact. Even capping direct payments at €60,000 without allowing labour deductions (DP2) has very limited redistributive effect, although payment amounts to the very largest holdings would be on average reduced by 9%. Only where no GAEC pass-through is allowed (DP3) do the redistributive effects become noticeable, with a 5% increase in payments to smaller holdings and a 29% reduction in payments to the very largest holdings. By contrast, the redistributive payment is shown to be considerably more effective at redistribution than capping. By construction, scenario PR3 is more redistributive than scenario PR2 and even more so than scenario PR1, because of the larger share of direct payments involved and the concentration of the top-up payment on fewer hectares. In the case of scenario PR3, the very smallest size group gains 23%, while the largest size group loses 13%. The reason for the greater impact on redistribution is that all hectares above the 52 hectare threshold (or 30 hectares in PR3) contribute to the top-up payment on smaller farms, and not only the hectares on the very largest farms. Moreover, the redistributive payment at the rates that France intended to use would result in a larger reduction in payments to the largest holdings than would capping on its own. Vincent Chatellier does not combine the two options (capping and the redistributive payment) in his paper although under the Commission proposals both options would be compulsory (although only for capping are minimum obligations included in the legislation). The original paper also shows the degree of redistribution by type of farming and region under the various scenarios. The extent of redistribution needs to be kept in perspective. In 2015, holdings less than 100 ha received 37.2% of direct payments in France. After the PR3 simulation (by far the most effective at redistribution) these holdings would receive 39.2% of direct aids. While the intent of the redistributive payment is to favour smaller farms (and thus supposedly those with smaller incomes), Chatellier points out that many of the beneficiaries on smaller hectares are vineyards, fruit and vegetable growers and pig farms that have high output and earnings per hectare. What insights do we get from this analysis? One conclusion is that, for those Member States that might wish to focus direct payments on smaller holdings, the redistributive payment can be an effective instrument. The lower the threshold, the larger the benefit to the very smallest holdings but, at the same time, the fewer the number of holdings that benefit. The simulations also highlight the importance of the way in which ownership structures are treated for the redistributive outcome. 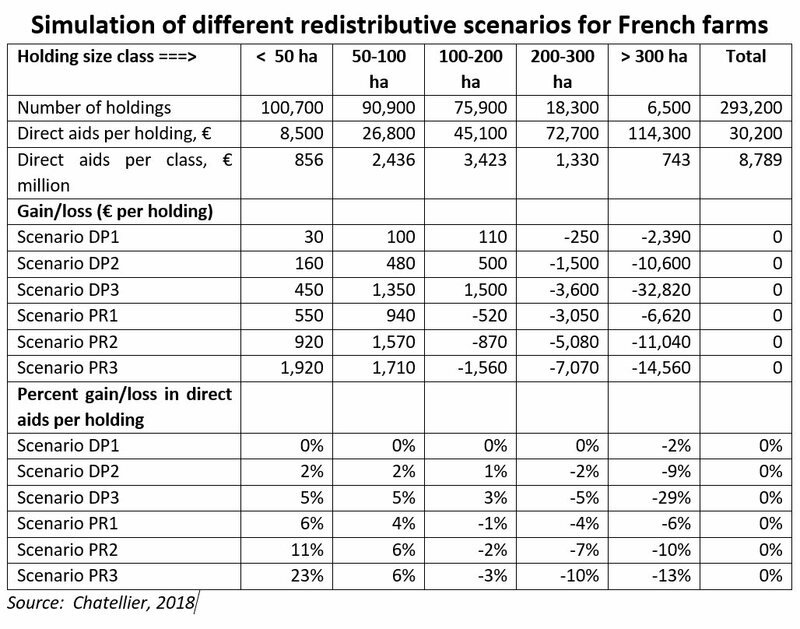 In France, if large co-operative farms are treated as a single unit, then both the redistributive payment and even capping (depending on whether salaries can be deducted or not before the threshold is applied) have a significantly greater impact. We need to have much greater clarity and understanding of the ownership structure of very large holdings if we are to predict the impact of capping and the redistributive payment. Finally, not all Member States will want to support small farms for their own sake. For these Member States, it will be interesting to see how much weight the Commission gives to the objective of a fairer distribution of support when approving their CAP Strategic Plans. Update 5 Sept 2018: Link to the Chatellier paper has been updated. Before mechanisms are discussed the objectives must be clear. The importance of clear objectives was brought home to me by one of the most successful agro-environmentalists. This individual was way ahead of others in developing scientific basis for pollen and nectar mixes and other environmental enhancement mechanisms (some 30 years ago). But he will use herbicides or even insecticides to establish the plant community if it maximises the benefit. The objective is every bit as complex as the CAP but equally delivery requires on the targets. Playing around with payments must have a clear objective in mind and this appears to be missing. Small farmers does not NECESSARILY mean greater productivity, better environmental management, higher food safety, lower greenhouse gas emissions or even higher social cohesion. It certainly does not result in more farming entrepreneurs and may not result in more vibrant local communities if it means loss of employees or more livelihoods are at a subsistence level. Any of these objectives is at best only clumsily achieved by changing farm payment allocation.Perhaps the only achievement is to create smaller farms, reduce farm employees and create subsidy reliance. This may be the intention but this is not the rhetoric. Thus if you want more pollinators pay for them. If you want more vibrant villages lower property taxes for the whole community and put in broadband. If you want entrepreneurs and new entrants remove subsidy. If you want to improve productivity help farms to invest in technology (remember the FHDS? ), provide assistance to exit the industry and opt for a more laissez faire approach to genetic modification and pesticide (limiting use only on rigorous health and environmental grounds). If you want smaller farms set an upper limit but be warned that if your objective is to destroy wealthy landowners their farms tend to be tenanted and subsidy is received via rent. This is not radical thought -but it would be refreshing and less like treacle to have objectives. Referirng to Recital (36) of Regulation 1307/2013 the target of Redistributive payment is “to redistribute direct support between farmers by granting them an extra (reducing — for others; EP) payment for the first hectares.” Since Redistributive payment has no relation with the number of persons employed by farm, in many cases redistributive mechanism reduces payments for persons whose relative share of payments is lower than the recipients of the redistributive payment. Why did this happen? From the aforementioned preamble, it is clear that the problem lies in the definition of a “farmer”.The Regulation creates impression that transfers should be made from one person (a large farmer) to another (small). However, there are many structures that do not fit into the definition of a farmer, in the EU’s primary agricultural production, f.i. cooperatives. With eyes closed against reality, the EU institutions are persistently reluctant to expand the definition of “Farmer” by replacing it with the term “Farm”. Despite enormous changes in structure, EU legal acts still (since 1957) tend to ignore reality and pretend that agricultural production is still produced by individual farmers. The situation evokes in mind a joke about manager asking train driver to whistle and make noise so everyone thinks that stagnating train is moving.